Moab is a funny little place. 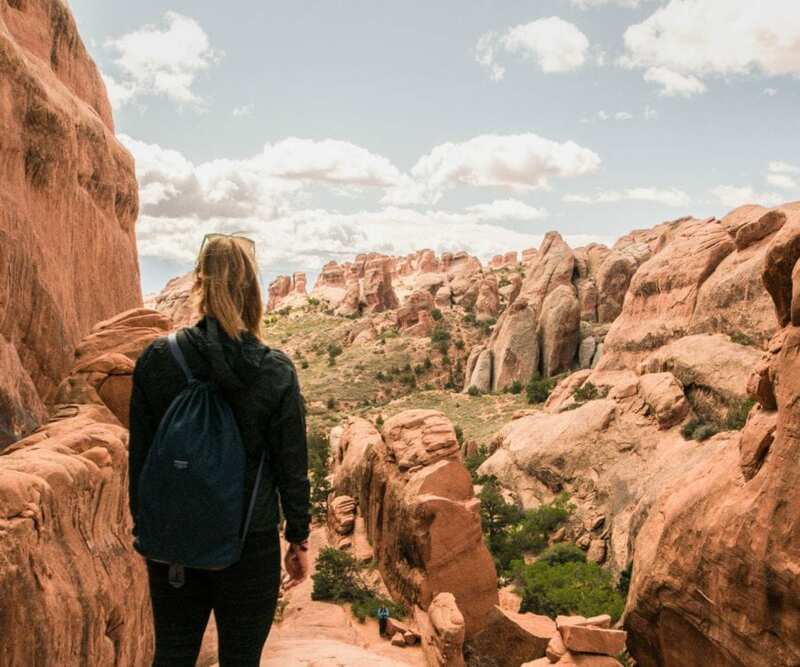 Sat right outside of Arches National Park and less than 30 miles away from Canyonlands National Park and Dead Horse State Park it’s a popular destination for adventurers. 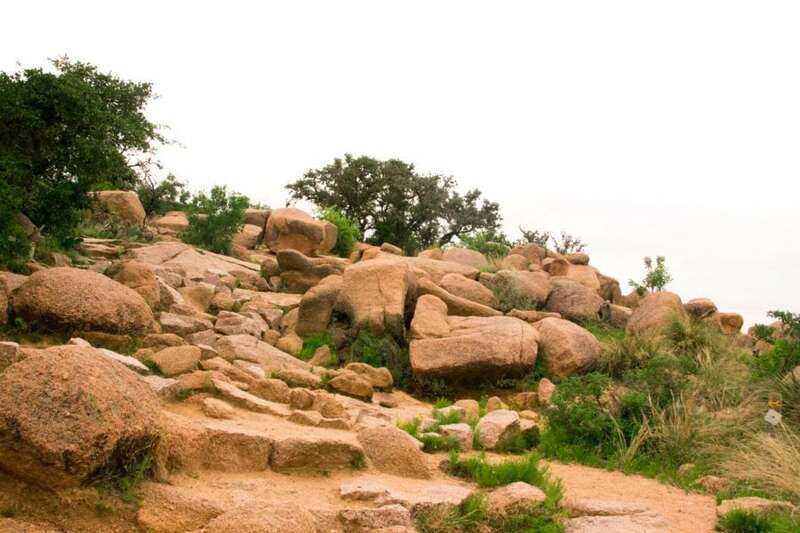 It’s a mix of hippies looking to “get away from it all”, hikers hoping to explore the back country, muddy mountain bikers and petrol heads wanting to tackle the 4×4 roads. Given its proximity to National Parks, Moab tends to get pretty busy. Even at the end of April when there are no holidays it’s a popular place to be. That means that finding budget accommodation can be pretty tricky. But it’s not impossible. It also means that finding any where at all to sleep can be hard! 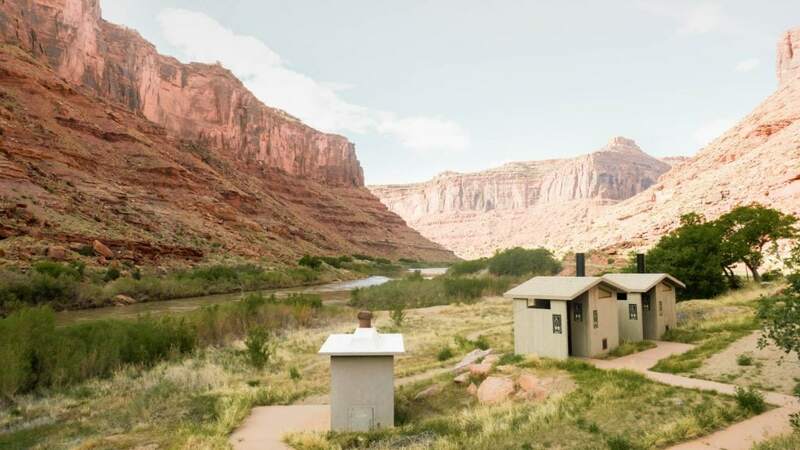 Most of the campgrounds around Moab are BLM (Bureau of Land Management) property which tend not to include luxuries such as proper toilets and showers. There’s absolutely no chance of getting any wifi out there either – and you can forget phone signal one you leave the centre of Moab. 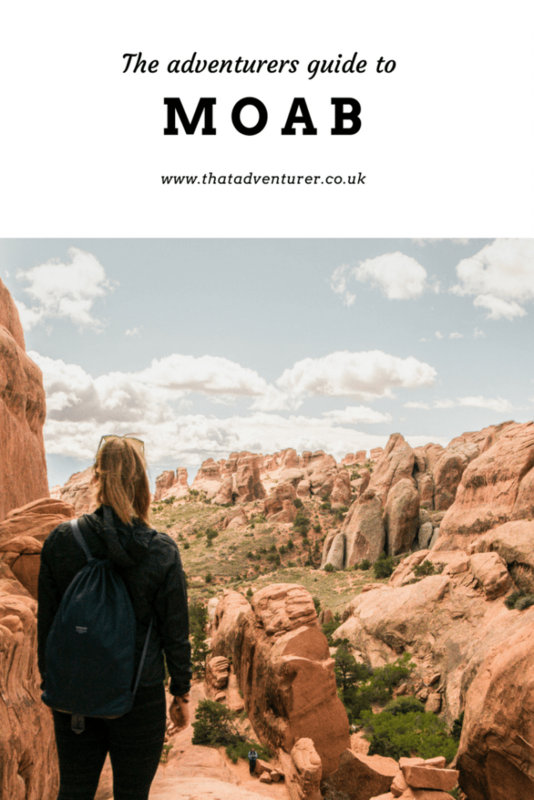 We spent three days in Moab (for a grand total of $44 each) and in that time explored the town searching out the best places to eat, sleep, shower, browse the internet and shop. If you’re heading to Moab then this ultimate adventurers guide to Moab should help you. 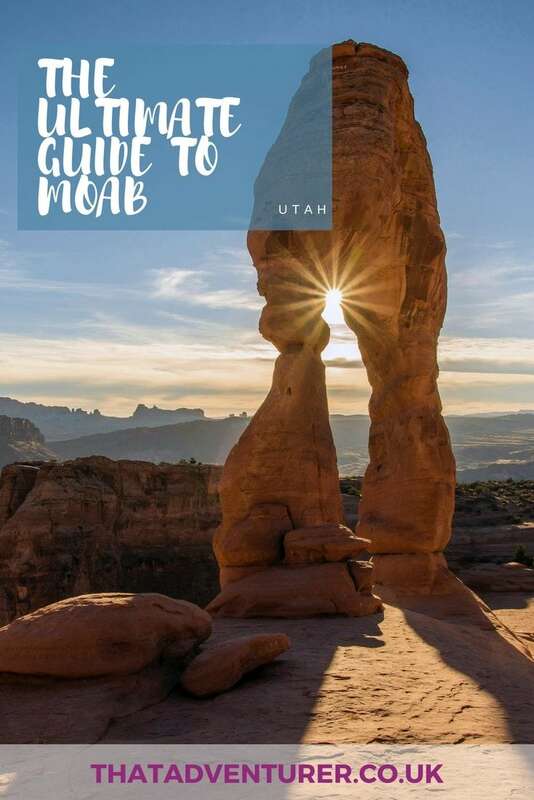 You can find a list of Moab RV parks and campgrounds here. Here is a map of BLM campgrounds near Moab. Looking for more Utah travel ideas? Moab is popular all year round, even at the end of April we discovered pretty much everywhere to stay was full. For this reason make sure your Moab accommodation (whichever type you choose) early. For such a small place, Moab has a decent selection of hotels and motels. There are the usual suspects; Super 8, Motel 6 and Marriott and a few independent places. The vast amount of visitors to Moab seem to rock up in their huge RVs (seriously, some of them must be twice the size of my old flat in London). They tend to stay in the privately owned RV Parks where they can clean our their dump tanks and probably get some wifi. There are lots of BLM campgrounds in and around Moab although you will have to pay for most of them. Those closest to Arches National Park cost upwards of $20 whereas those a little bit further are $15. These are getting full earlier and earlier each day as the season goes on. Most of those closest to Arches National Park were full by 4pm. If you have your heart set on staying in one it’s probably best to arrive early, find something to leave in your spot, then head off out adventuring. These campgrounds have compost type toilets but no water or showers. Bring everything you need with you and take everything back out too. If you’re travelling in a camper van, or sleeping in your car, then you could opt for stealth camping. This is the option we went for when we saw that the BLM campgrounds were full. I’m sure it goes without saying that you’re parking on the road, not camping. So don’t get your camp chairs out and sit on the pavement. You’re trying to be stealthy, remember? 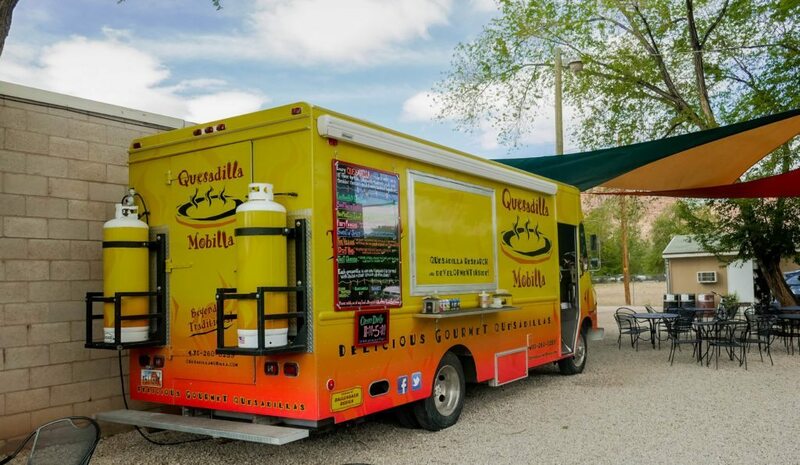 Moab has a myriad of food options from pretty much all cuisines. Some of the best and most popular are the following. There wasn’t a time we drove past this and it wasn’t heaving. We went here for dinner after hiking all over Arches National Park and would recommend it to anyone who’s feeling hungry after a full day of adventures. 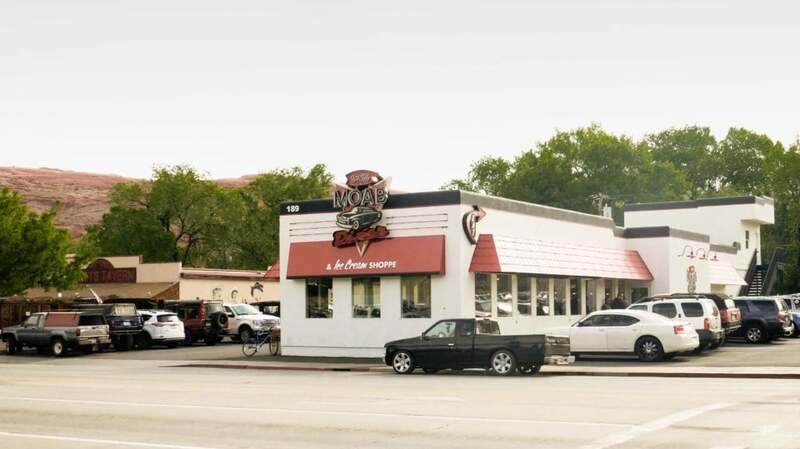 Stick to the more traditional diner options (burgers and chips) as that’s what they do best. Some people were ordering roast turkey dinners that didn’t seem to go down too well but we were pleased with our burgers and milkshakes. Oh and for reference the salted caramel milkshake is the best! You’ll have to eat early if you want to eat here or go for lunch as it closes at 5pm. We passed by on our last day and there were hoards of people outside. It’s also the number one restaurant in Moab on Tripadvisor. We ate breakfast here on our last day. The place was packed and had a constant stream of people coming and going. I thoroughly recommend their cinnamon rolls and the breakfast bagel but not so much their French toast (it just seemed a bit dry and not at all eggy?). The cookies looked great too. After a day (or 5) or hiking, mountain biking, and just general living chances are you’ll feel in need of a shower. 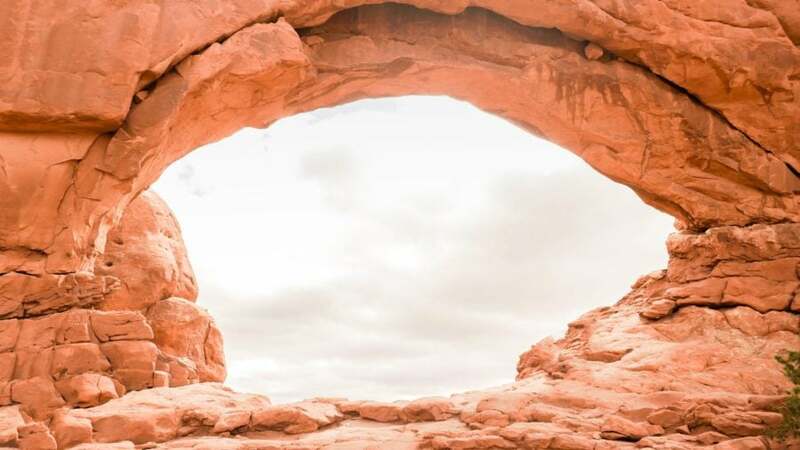 The good news is that even if you’re not staying in a hotel, motel or private campground, you can still find a shower in Moab. We opted for the shower at Dowd Flats campground which is the cheapest in the whole of Moab. For $3 you get 5 minutes or brilliantly hot water and can add quarters to extend the time if needed. They were clean and it was the best $3 I spent during our stay in Moab. You can also use the showers at the Moab sports and recreation centre. Whilst you here you could also go for a swim if you fancy. It costs $5 for entry. You can see a full list of places to shower in Moab on tourism website. We have data on our phone but the phone signal was so poor throughout Moab that sometimes we just really needed some wifi. Here are the places we found that did the best wifi in Moab. The Moab Laundry is the place to be not just for clean clothes but for some decent wifi. This was the most reliable connection and it was speedy too. If you’re feeling cheeky then just park up outside and connect. This coffee and clothes/souvenir shop also has some speedy wifi – it was even good enough to upload a Youtube video. They also didn’t seem to mind when we sat in there all afternoon until closing while I edited photos and Thom coded. The place we love to hate. Normally McDonalds has some pretty reliable wifi. This one did have wifi but it wasn’t as good as the options above. It works well enough for emails but not enough for streaming. This café also has internet and a few people in there had their laptops out even at busy breakfast time. If you haven’t got a laptop with you but want to use a computer, they also have one there for your use – Old Skool! For those of you who need your caffeine hit to get you going in the morning, this is where you’ll find the best. 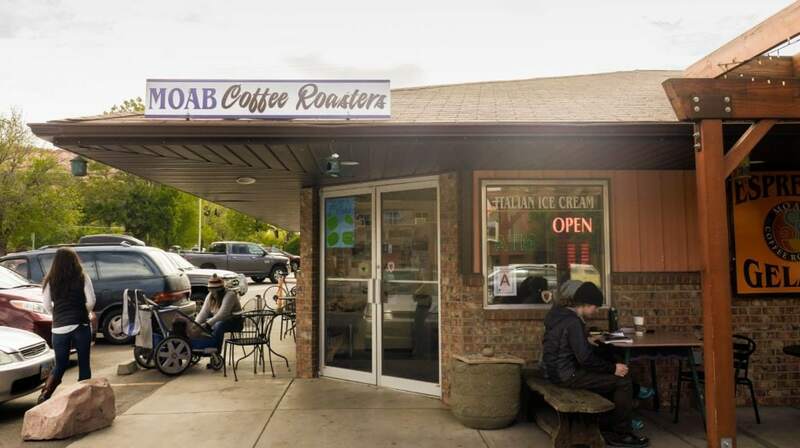 Without a doubt the best place to get coffee in Moab is the Moab Coffee Roasters. When you walk in through the door the smell of coffee alone is enough to wake you up. A sign on the wall says it’s so good because; it’s organic and Fairtrade, freshly roasted and freshly prepared. You’ve got to try one of their iced coffees. You know how usually the last bit of an iced coffee is just watery muck? These aren’t because the Moab Coffee Roasters freeze their coffee into ice cubes. So, as these ice cubes melt you just get more coffee. Genius! Real coffee aficionados might kill me for saying this but I actually don’t think McDonald’s coffee is all that bad. Plus, it’s super cheap at just $1 ($1.08 incl. tax). If you’re a Starbucks fan you might be disappointed to hear that Starbucks doesn’t have its own premises. There is, however, a Starbucks concession inside City Market. There’s just nowhere for you to sit (and use their wifi). Whilst there isn’t a Wal-mart for miles, there are several smallish supermarkets in Moab to stock up on supplies. There are also a few cool shops worth popping into. You’ll find everything you need food wise here. They even do pre-made sandwiches and salads to take with you for the day which doesn’t seem to be that common in the US. A favourite with the more hippyish population of Moab, Moonflower specialises in organic and natural foods. It’s the kind of shop I like browsing but don’t purchase anything due to the fact I can’t bear to part with almost $5 for a chocolate bar. You ought to know by now that I love bookshops. 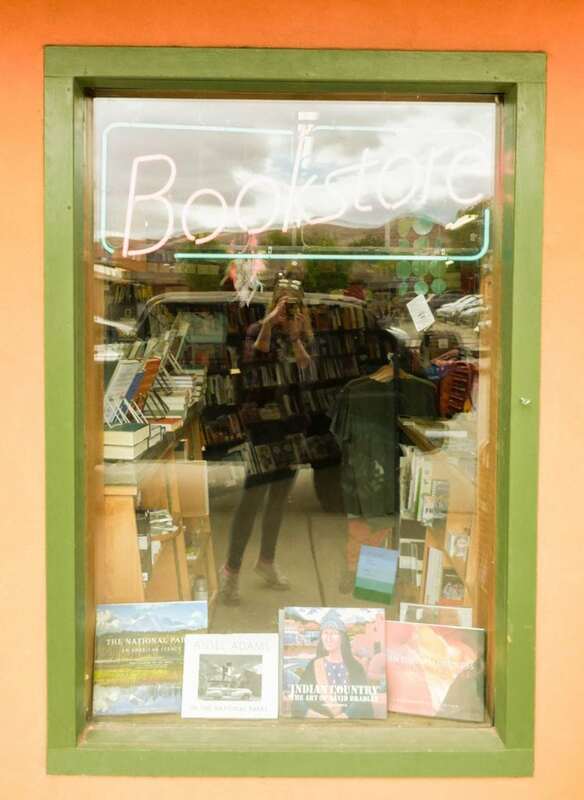 The bookshop in Moab Is no exception. Not only do they have recent releases but they’ve also got an adventure section, a Wild West section and rare books towards the back too. For an arty souvenir for yourself or someone else, pop into Made in Moab which has jewellery, prints, clothes and toiletries all made by various local artists. My favourite was definitely the photos of LEGO men exploring Arches National Park. Hopefully that’s pretty much everything covered in the above ultimate adventurers guide to Moab. Where ever you stay, eat and drink your cup of morning coffee you’re bound to have fun! This is perfect timing! We’re heading off an a week-long road trip to do the Mighty 5 in Utah – and now I’m REALLY freaking out about accommodation!! 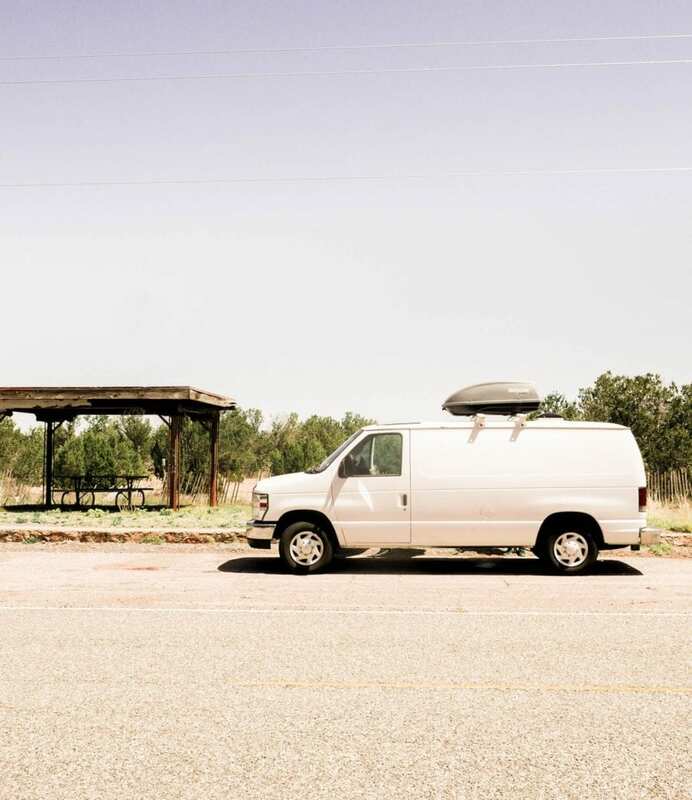 We’re hiring a van so hopefully we can do something similar to what you did… yikes!! Your trip looks amazing! Download the app IOverlander, it’s full of free places and cheapish campsites to stay at. And if all else fails you can stay at the side of a road like us. Thanks! I haven’t heard of that app, downloading it now. So I guess it was super easy to park roadside?? It was for us, all roadside parking seemed to be free and there weren’t any signs saying overnight parking was prohibited. Good luck! Whereabouts in Canada have you been? We’re in Vancouver now (the final destination of our trip!) 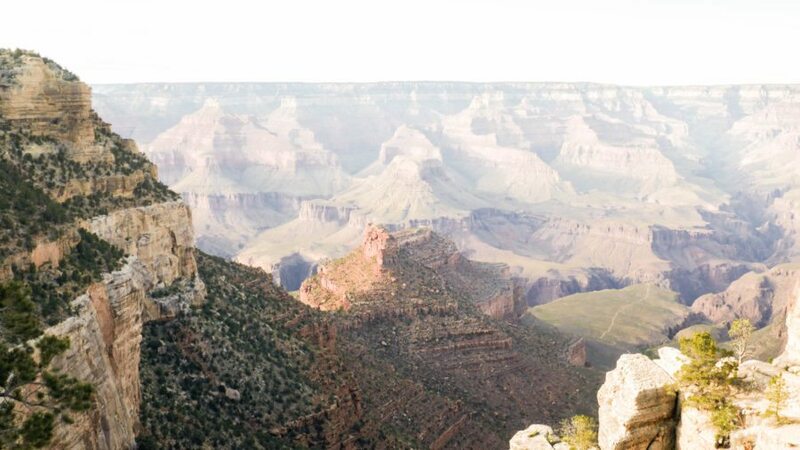 I fell so in love with America’s National Parks!